Social security reforms in advanced economies may give people incentives to work past retirement age. The column estimates the financial incentives to work or retire at each age for elderly men and women in Japan. There is a correlation between series of social security reforms to reduce generosity and the recent recovery of employment rates for men aged 60-69 and for women aged 55-64. Accelerated population ageing is especially prevalent in industrialised countries. It exacerbates the labour shortage and creates financial pressure that threatens the sustainability of social security programs, so it is now a common, serious, and urgent policy issue. In this context, there is good news in a forthcoming book from the NBER International Social Security Project. It shows a U-shaped recovery in labour force participation (LFP) among older generations in the mid-to-late 1990s (Coile et al. 2019). The reversal of LFP among the elderly has occurred in 12 industrialised countries, although in Japan the rebound did not occur until the mid-2000s. What created this reversal? Improved health status and extended life expectancy in recent decades might be underlying driving forces (Oshio and Shimizutani 2018). Economists, though, believe social security reforms played an important role in the rebound by modifying the labour supply incentive. We recently examined the relationship between the employment rate of older generations and social security reforms implemented in Japan since the 1980s (Oshio et al. 2018). These institutional changes included extending the eligibility age, reducing actuarial adjustment factors, revising the earnings-tested social security program (zaishoku), and encouraging elderly workers to remain in the labour force longer using a wage subsidy for elderly employment. When quantifying the impact of social security reform on the decision to work, it is useful to summarise the institutional changes and other reforms into a single index. This represents the tax forces supporting the decision to retire early. In this case, we define the key measure as an implicit tax (ITAX) on individuals who work longer and therefore claim later. For simplicity, we assume that an individual at retirement age faces two choices: continue to work, or retire and claim benefit. First, we computed the social security wealth (SSW) which is the discount value of all future social security benefits. We applied the benefit formulae to each age and cohort by assuming an earning profile, discount rate and survival probability. Second, we calculated the 'accrual' of SSW (called ACC). Suppose one decides to delay claiming benefit by one year. While the benefit is lost for one year, the annual benefit after two years will be larger due to additional contribution and actuarial adjustment. The net effect is not decisive but, in most cases, it is positive. If the value is positive, a worker is motivated to work longer. If it is negative, that person has an incentive to retire early. Third, we define ITAX as negative ACC divided by after-tax earnings during the additional year of work. A positive value of ITAX (implying negative ACC) represents a tax on working (in other words, an incentive to retire early). A negative value of ITAX (positive ACC) shows a subsidy on working (an incentive to work longer). 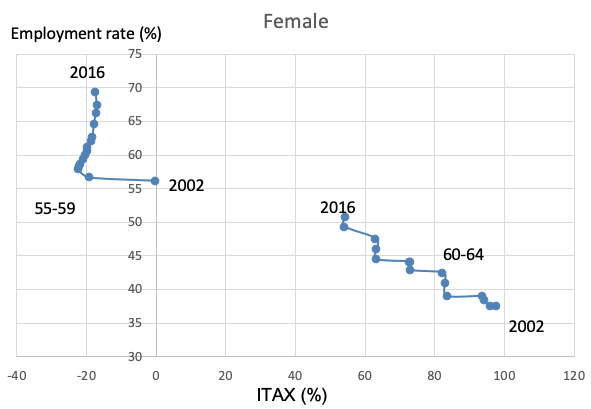 The study computed ITAX at each age (55 to 69) and each year (1980 to 2016), and estimated ITAX by gender and earnings level. The evolution of the ITAX indicator effectively captures social security reforms in Japan. For example, ITAX for men aged 60-64, which rebounded in the mid-2000s, was around 80-90% in the mid-1980s, followed by a gradual decline throughout the 1990s along with less generosity, and in 2001 dropped sharply to around 40% where it remains. The substantial decline in the 2000s was caused by raising the eligible age. It seems that economic incentives have worked. 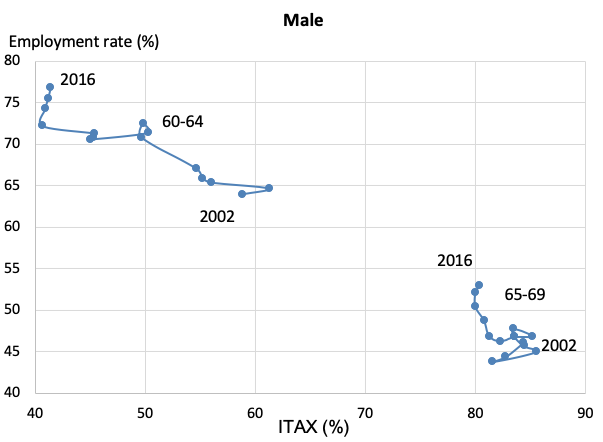 Figure 1 shows a negative relationship between employment rate and ITAX for men (60-64 and 65-69) and women (55-59 and 60-64) between 2002 and 2016. For example, ITAX declined about 20% and employment rate increased by 15% for men aged 60-64 during the period. Although a negative relationship is not clearly observed before the 2000s (not shown), the negative association after the 2000s supports the idea that social security reforms, particularly extending eligibility age, encouraged the elderly men’s employment rate by reducing ITAX. A simple regression using the sample in 1980-2016 also confirmed a negative and significant relationship between ITAX and the elderly employment rate. Source: Figures 14 and 15 in Oshio et al. (2018). We conclude that a reduction in ITAX under a series of social security reforms to reduce generosity was associated with the recent recovery of employment rates for men aged 60-69 and for women aged 55-64. But while the analysis captures the essence of the impact of social security reforms on the incentive to work, we need to make some remarks on the results. The retirement pathways are oversimplified. In order to compute SSW, we assumed two pathways, a choice between working full-time or exiting the labour force and claiming benefit. In reality, however, there is a large segment of working pensioners in Japan, especially in the age 60-64 demographic, who do some work and also claim benefit. There is non-negligible proportion who have returned to the labour market. This shows that exiting the labour force is not a one-way street. And most of the Japanese older generations do not withdraw from the labour market all at once. After mandatory retirement, they move from full-time to part-time, and gradually reduce their working hours (Shimizutani 2011). We need to consider al these components to make the analysis more realistic. The estimate of the impact of reforms needs more detail. What part of the increase in the employment rate was caused by the social security reforms? There is a significant association between ITAX and employment rates in 12 industrialised countries, but we still need to identify the impact of social security reforms, and the impact of other factors such as health status or spouse work status on the employment decision. We need to extract lessons for desirable policy design regarding elderly employment and social security areas, which are mutually dependent. If we are to do this, we should pay attention to heterogeneity among older generations. In particular, the variation in health and retirement savings will be critical to understand the effect of social security reforms on employment. Our findings are particularly informative for governments that aim to increase the retirement age to 70 years. Using micro-level longitudinal data would be a potential line of research, and there is already an NBER project to do this. If we accumulate domestic and international evidence, it will improve policymaking in rapidly aging societies. Coile, C, K Milligan, and D Wise (2019), Social Security Programs and Retirement around the World: Working Longer, University of Chicago Press, forthcoming. Oshio, T, A Oishi and S Shimizutani (2018), "Social Security Programs and the Elderly Employment in Japan", NBER working paper 25243. Oshio, T and S Shimizutani (2018), "Health capacity to work and its long-term trends among the Japanese elderly", Journal of the Japanese and International Economies. Satoshi Shimizutani (2011). “A New Anatomy of the Retirement Process in Japan,” Japan and the World Economy 23(3): 141-152.